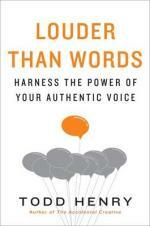 This book, Louder than words, harness the power of your authentic voice, was so quotable – my copy has many underlined sections with pencil. If you are trying to make yourself heard in your organisation or your art, this book contains many useful concepts. Todd Henry discusses the three elements needed to amplify your authentic voice through your work – identity, vision and mastery. I answered some of the questions in the book, so I can tell you that my weakest element is mastery. Hence, why I continue to go to writing classes and write daily. Henry talks about the hurdles we need to overcome in order to cultivate our authentic voice – fears, limiting narratives, inertia. He discusses his ‘dailies’ – daily checklists for personal and professional interests, such as having a meaningful conversation with his wife and three children, reading, writing, exercise, generating ideas, business development. One of my favourite sections is Henry’s quote from Ira Glass. ‘What nobody tells people who are beginners – and I really wish someone had told this to me – is that all of us who do creative work, we get into it because we have good taste. But there is this gap. For the first couple of years you make stuff, and it’s just not that good. It’s trying to be good, it has potential, but it’s not. But your taste, the thing that got you into the game, is still killer. And your taste is why your work disappoints you. A lot of people never get past this phase. They quit. Most people I know who do interesting, creative work went through years of this … It is only by going through a volume of work that you will close that gap, and your work will be as good as your ambitions. It’s going to take a while. It’s normal to take a while. You’ve just got to fight your way through. There are so many creatives out there whose voice I admire – because it seems unique and effortless. And it is definitely unique, but it probably took all those years to uncover it. Here’s to all of us – the health sages and the marketing gurus, the tech-savy and the corporate, the designers and the bloggers, the loud ones and the quiet ones, those of us uncovering our identities or refining our vision or practising our mastery – let’s keep on cultivating our authentic voices.